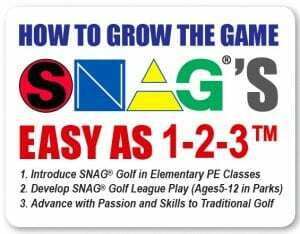 SNAG® Leagues – The perfect recreational stepping stone to the more competitive junior golf leagues. SNAG® Leagues, better known as golf’s version of “T-Ball”, are introductory leagues that we anticipate leading youngsters into the more competitive environment of the PGA Junior Leagues. The SNAG® Leagues will take place in a recreational environment in order for youngsters to build upon fundamental skills needed in preparation for a more competitive environment in the future. More importantly perhaps, these leagues will provide a facilitation structure conducive to FUN and SUCCESS, two components related to continued participation! Offering these leagues through partnerships with the park and recreation facilities enables golf to be an option of play for kids ages 5 and up. Not every golfer is going to go pro, in fact a very small percentage actually do. But Golf is a Life-Sport that very few sports can match. That is why bringing golf to a recreational setting, just as other sports do, will allow more “new” golfers to enjoy the benefits of this lifetime sport. While the primary market is predominately young children age 5 to 12 years old, the joys of golf and your camps should not be limited to only this age group. The two most significant groups who can benefit from a camp experience are as follows . . . The Mom’s & Dad’s SNAG® Experience – As young children learn to play SNAG® golf, they will naturally want to transition to a real golf course as they age. What an opportunity for families to partake in a lifetime group activity playing not only SNAG® but tradition golf for years. To take advantage of a lifetime of family bonding, Moms and Dads other family members need to learn golf as well. A specialized Parent Camp is a low pressure, fun way to introduce golf and learn the four basic swings. Smart Camp operators will identify and create these separate camp opportunities. Senior Camps – All the most up-to-date information on improving the quality and length of Senior life includes strong opportunities for exercise, socialization and regular scheduled activities to look forward to. Think what a great opportunity a SNAG® Camp provides for this population. Community Recreation department are struggling to provide for this very important aspect of their communities. A turn-key SNAG® Camp is the perfect solution and an affordable community asset.